In Washington, U.S. Secretary of Energy Rick Perry announced four funding opportunities totaling up to $78 million to support early-stage bioenergy research and development under the Office of Energy Efficiency and Renewable Energy’s Bioenergy Technologies Office. More on the FOA here. Letters of Intent for these FOAs are due May 30, 2018, and full applications are due June 27, 2018. 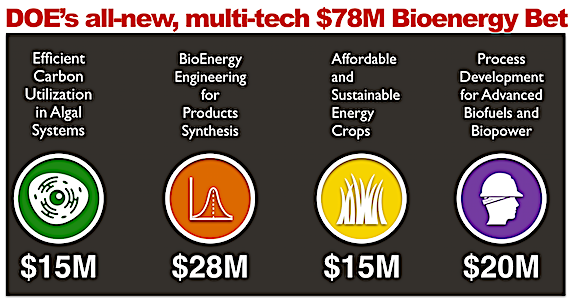 More about these Bioenergy funding opportunities, including a schedule of upcoming webinars. For more information and application requirements, please visit the EERE Exchange website. More information about DOE’s Bioenergy Technologies Office can be found HERE.